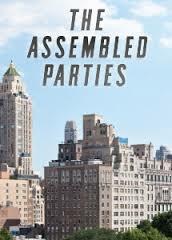 Anyone who has even suffered the slightest twinge of real estate envy should stay away from the Manhattan Theatre Club’s The Assembled Parties. The play, set in a lavish 14-room apartment on Central Park West (designed by Santo Loquasto) would make even the 1% pea green with envy. This imperfect play by Richard Greenberg takes place in two discreet times periods; 1980 and 2000, on the same day. At times the two acts even feel like two discreet plays. This is not a unique theatrical phenomenon and can work, but it’s a terrific hurdle to clear. Recently, the device was used in Clybourne Park and there wouldn’t have been a play without it. The key to its effectiveness is to create two acts, or time periods of equal force. The first act is a rapid and rotating collage of a family assembled on Christmas. Christmas could easily be replaced by Thanksgiving or Passover for this Jewish family, as it’s just an excuse to gather and overeat. The curtain rises on Julie (Jessica Hecht) in the kitchen (the size of most living rooms) with her eldest son’s friend Jeff (Jeremy Shamos). Jeff is young and socially out of his league in the presence of the glamorous (former movie actress) Julie. She speaks in a cadence not usually found in nature and is dressed in a jumpsuit created by her mother (a renowned designer.) Julie teases Jeff with obvious affection and Jeff seems on the edge of pinching himself throughout. He is a first-semester Harvard Law student, the son of first generation Jews and he’s spending Christmas at the captain’s table. Julie’s husband Ben (Jonathan Walker) appears and we learn of another (much younger) son who is upstairs with a cold. The set then starts its rotation and the apartment and the family dynamics unfold. We meet Julie and Jeff’s two sons; Scott (Jake Silberman) and Timmy (Alex Dreier). Ben’s sister Faye (Judith Light) arrives with her husband Mort (Mark Blum) and her lumpish daughter Shelley (Lauren Blumenfeld). Director Lynne Meadow has the women characters use pronounced accents & Ms. Blumenfeld’s is beyond enjoyable. Shelley grew up (and stayed) in Roslyn, an unambitious and perhaps intellectually challenged 30-year-old single woman. Her blank face and very low center of gravity is a wonderful counter to the rapid fire speech and movement of her extended family. And the first act does move. Just when we’ve learned something new, the set rotates once again and more story unfolds. Faye is not happy, in that; “I miss Miltown” way. Ms. Light (as we saw in Other Desert Cities) is superb at portraying complicated women entirely at ease with their shortcomings. She is splendid and is given an embarrassment of riches of one-liners with which to work. You could create a fabulous twitter feed out of her zingers (both English and Yiddish) and pronouncements. This is not to suggest that her performance relies upon these quips. Not at all. But one does wonder if Mr. Greenberg wrote these gems with Ms. Light in mind. That niggling little thought got in my way during the sedate second act. The curtain opens to a non-rotating large living room set that bares no resemblance to the fist set. We spend several moments wondering if the family (what little there is left of it) has moved. The husbands have died and Scotty (who looked a bit flush in the first act) died in 1981. Ms. Light delivers the line that informs us that Scotty died from AIDS; from a blood transfusion in a New York City hospital in 1981. Now it’s possible that if we combed medical records from 1981, this might have actually happened; but it probably would never have ever been identified as such. Scotty had just spent time overseas and could have easily been killed off by a myriad of diseases. That this implausible death was created and spoke of by Ms. Light (a longtime AIDS activist with a famed association with Ryan White) was distracting. There are other distracting theatrical devices that unfold in the second act which weaken the impact of what should be a moving play. One definite asset to the second act is Mr. Silberman; ill at ease as Scotty in the first act he flourishes as grown-up Timmy. It’s clear in the first act that the character of Timmy is a device. His little boy self, ensconced in Star Wars sheets is ignored by his parents (on Christmas) and his existence is never explained (it’s not customary to have two children 20 years apart.) Yet the other characters or so wonderfully and fully formed. Mr. Greenberg captures the subtleties of middle-class New York Jews so perfectly and to utter delight. There are cultural conflicts and tensions beautifully and delicately rendered. None of these illuminations are delivered in a “The More You Know” public service announcement, but as real and integral dialogue. There is much to love about The Assembled Parties. The performances alone are worth the very fast 2 1/2 hours.